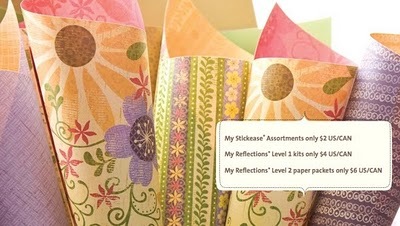 From August 4 at 9 am (MDT) through August 11, while supplies last, you can purchase selected My Stickease® assortments for only $2, My Reflections® Level 1 kits for only $4, and My Reflections® Level 2 paper packets for only $6 on my MyCTMH® website. Because these deals are so amazing, CTMH will not be offering these deals any other way. So go to my website on August 4th and place your order. Remember, it's "while quantities last", so don't delay! A wonderfully generous CTMH consultant named Kristen Woodie put together an incredible list of the paper packs that are going up for sale in a few days. I've added the link to the list at the top, so check it out, make your wish list and then go to my website on Wednesday to place your order. That's what I'm going to do. If you have any questions, just email or call me.